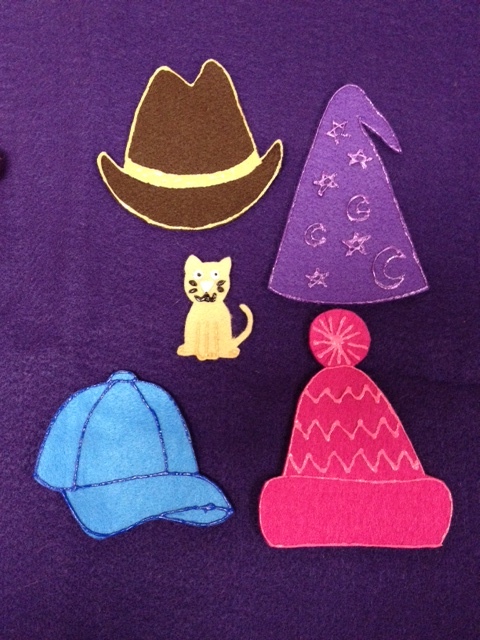 Flannel Friday: Kitty Cat, Kitty Cat, Are You In The Blue Hat? One of my most popular flannels has been Baby Duck, Baby Duck. I’ve also used the traditional Little Mouse version (that actually RHYMES) to great success. So, here’s another. Because, WHY NOT? Holy over-exposure, batman! Oh well. You get the idea. 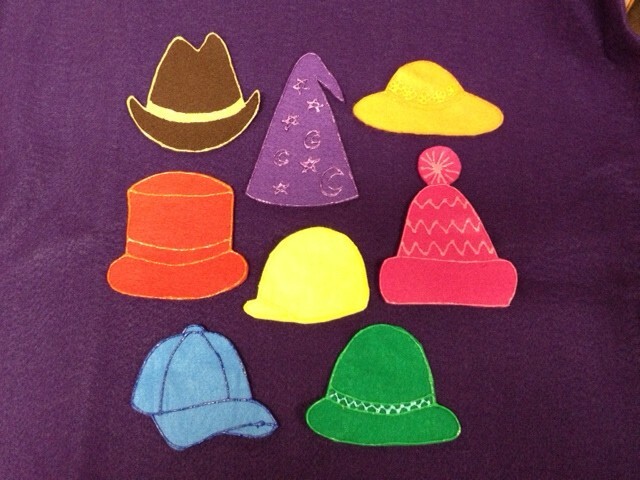 I whip the hat off the board and…*gasp! *…he’s there! Or he isn’t. The kids LOVE this game. They feel great when they find him but don’t suffer any great hard feelings when they don’t. Make sure you either have enough pieces for everyone to have a turn, or are willing to re-hide the cat if he’s found so that everyone has a turn. And EXPLAIN that you’re going to do this at the beginning. EVERYONE must get a turn or there will be ugly crying. And who wants that? Today’s flannel roundup (floundup?) will be hosted by Kathryn. For all past flannels, click the pinterest link to the right. I have to start with a shout-out to my friend Becky who runs Denver Craft Ninjas (and who has just started an awesome new crafting party business, Kunoichi Craft Events): after several felt-related craft projects, she found herself left with far more felt than she could ever hope to use up. So she very kindly donated a chunk of it to the library for flannelboard making! That’s how I was able to create the clothes dryer below: with a large piece of cream-colored felt courtesy of Becky and the Denver Craft Ninjas. I told the kids that I did my laundry before I came, and now I needed their help to sort the socks into pairs. If you’ve got a small enough group you can invite children up to pull out a sock and add it to the flannelboard. If its mate is already up there, they can put them together to make a pair. We identify the colors, too. If it’s a larger group like I had today, I do the sock pulling and putting. But the kids help me figure out what color we’ve got and if its mate is already on the board. The kids had a great time with this game – the yelled out the colors and quickly noted a match. It’s a great addition to my clothing-themed storytime! The clothes dryer is a box with a hole cut in (a kleenex box would work, although mine is a bit larger and sturdier), covered in cream-colored felt wrapped like a gift. I glued two pieces of felt over the hole but there’s plenty of room for me (or a kid) to stick my hand in and remove socks. I added black circles with paint for a little flair. I’m really proud of this project and so far, the kids have LOVED it! Today’s roundup will be hosted by Cate at Storytiming. And to see all past flannels, click on the icon to the right to visit our Pinterest page! 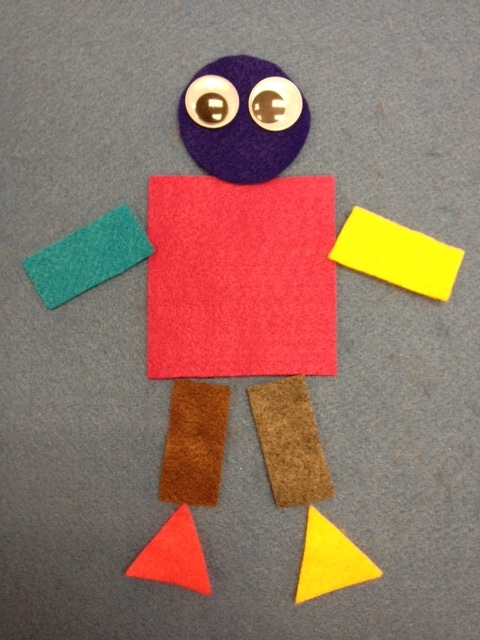 Flannel Friday: Make a Robot! Here’s a flannel idea that includes vocabulary learning (shapes, sizes), print awareness (shape names) and a whole lotta fun! We’re gonna build a robot! I cut a bunch of different-sized shapes out of felt. I stuck to square, rectangle, triangle and circle (because my portable flannelboard is small) but you could certainly add more. 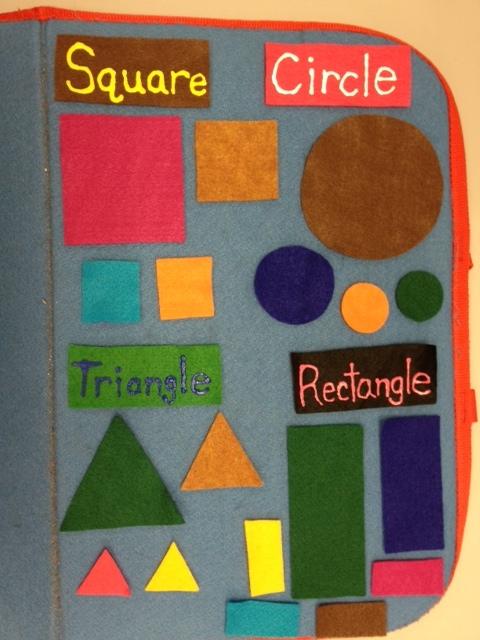 I also made labels for the four shape names in felt with fabric paint. The first thing we did was organize our robot “parts.” I put up the shape names and then I asked the kids the name of the shape I held up and put it with its name. I only asked them about 2 or 3 of each shape, because I made lots and it would have taken too long. But we did talk about if the new shape was “bigger” or “smaller” than the other, and I mentioned that we had small, medium and large sizes. 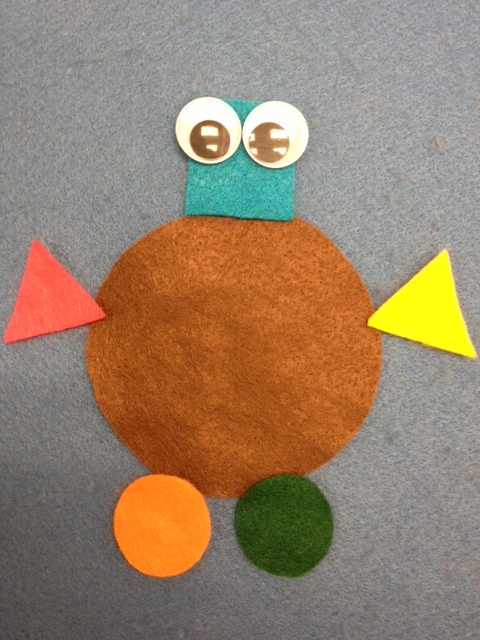 All-in-all I think the kids had fun and if you do crafts with your storytime it would be fun to then allow the kids to put together their own robots with paper shapes and glue. The flannel Friday roundup today will be hosted by Lisa at Libraryland. To see all past flannels organized into categories, click on the icon to the right for our Pinterest page. In the fall I always do a bedtime-themed storytime. It just feels like the right time of year to be thinking about long winter naps, so I break out the cozy (and silly and crazy and chaotic) stories about going to sleep. One book that I think is particularly gorgeous (and works great with my bilingual crew) is Sarah Weeks’ Counting Ovejas, illustrated by David Diaz. Bilingual text plus gorgeous, multi-colored sheep is a win in my book. I decided to make a flannel board of it. However, I realized that as each sheep comes and goes on the same page, it would be like “drive-by flanneling.” None of the sheep stay on the page very long. Also, for the higher numbers, I’d be making multiples: 10, TEN! yellow sheep. So, the flannelboard very quickly morphed into something like my monster guessing game flannel. The kids count with me as we put each one on the board. 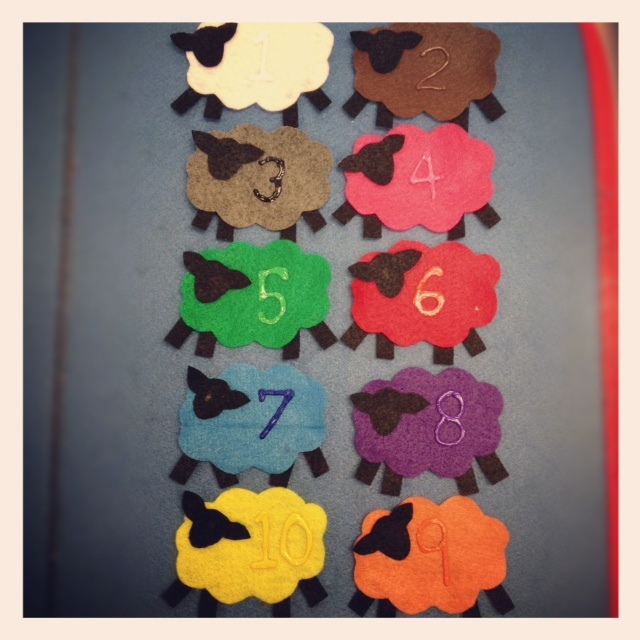 Then, I ask them “what color is sheep number 6?” So they’ve got to recognize the number, and then put the color with it. The teachers actually really liked this idea and I gave my pattern to a couple so they could recreate the activity. After identifying all the colors, I turn the board around and take one off (no peeking!). The kids then have to tell me which color, or number, or both, is missing. They had fun! This is an original pattern of mine, and I’m sharing it with you here. 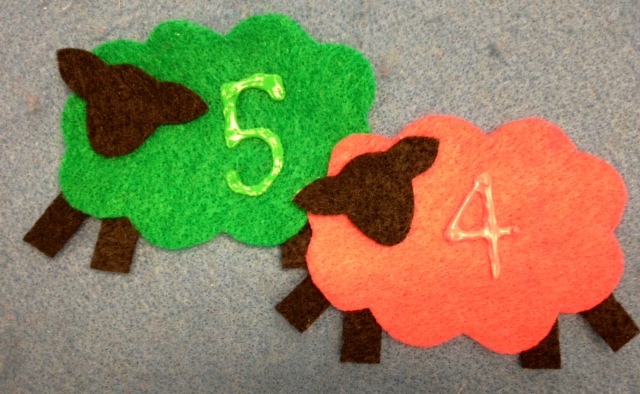 Feel free to make your own sheep! However, if you post the pattern on your site, be sure and give me credit. Today’s roundup is hosted by Sarah at Read, Sarah, Read! And if you’d like to see all past flannels, click on the icon to the right.